We love getting outside and taking our theatre to unusual and unexpected places. We have performed on the street, in fields, parks, gardens, forests and fish fridges. We have our very own theatre camp, fondly known as The Vagabond. It’s a playful space to spend time under the stars, to feel the earth beneath your feet, to dream, to laugh & to leave behind your daily worries. The Vagabond is the theatre equivalent of a travelling circus. It’s a beautiful tent, surrounded by an enchanting camp. It goes to places where theatre doesn’t usually go & opens the doors to theatre for every one. 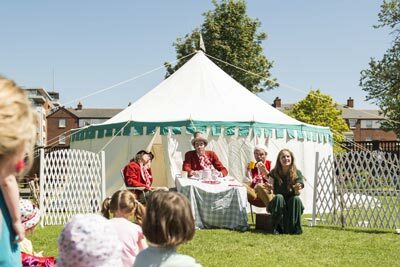 It’s a place for families & friends old & new, to come together to enjoy simple things; stories, music, food, good company & the magic of live theatre. We are alway open to new opportunities to perform our existing repetoir or create new work in unusual places. The Vagabond Camp can be as big as a blanket or fill a whole field. Every performance at The Vagabond is a relaxed performance, it a place where laughter, interaction & human expression are embraced.